Page Street Publishing, 9781624145629, 208pp. This new recipe collection from Alea Milham, author of Prep-Ahead Meals from Scratch and founder of the blog Premeditated Leftovers, is bursting with fresh, time-saving ways to fuel your family and yourself. Ready to end the days of skipped breakfasts and takeout lunches? With Alea’s expert advice, you’ll have your fridge stocked with homemade grab-and-go meals, full of ingredients you can feel good about. Simple do-ahead techniques help you savor even the busiest weekday mornings. Find breakfasts the whole family will enjoy, with options like Italian Vegetable Mini Frittatas, Garlic and Rosemary Sweet Potato Pancakes and Strawberry Rhubarb Baked Oatmeal. Packing lunch doesn’t have to mean the same old soggy salad! Batch cooking and ingredient prep make grabbing a flavorful meal from your lunch bag a no-brainer. Try the Bourbon Beef and Quinoa Bowl, Chopped Chimichurri Steak Salad and Chicken Marsala Pockets. Skip the pre-packaged snacks and try Alea’s recipes for your own treats and desserts, too. Prep-ahead meals take planning, so let Alea do the hard work for you. Recipes include instructions on how to store and reheat each dish, taking the guesswork out of meal prep. This book will help you build money-saving shopping habits and adopt clever cooking strategies that stick. From flavorful hot cereals and breakfast breads to one-bowl wonders and salads on the go, quick morning and afternoon meals will become the highlight of your day. 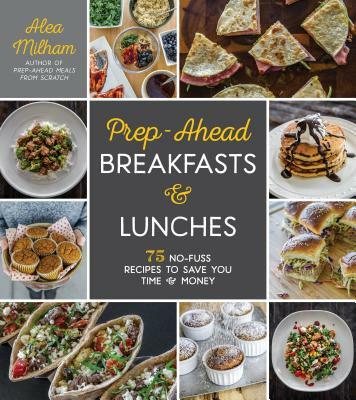 Alea Milham is the author of Prep-Ahead Meals from Scratch and the founder of the food blog Premeditated Leftovers. She has been featured on QVC, RealSimple.com and MSN Money, among others. Alea lives in Reno, Nevada.